Matt Szczur hit a go-ahead RBI double in the seventh inning and San Diego's bullpen pitched four scoreless innings to lift the Padres past the Washington Nationals 2-1 on Wednesday night. SAN DIEGO (AP) — Matt Szczur hit a go-ahead RBI double in the seventh inning and San Diego's bullpen pitched four scoreless innings to lift the Padres past the Washington Nationals 2-1 on Wednesday night. With the game tied at 1, Manuel Margot opened the seventh with a single — his third hit of the game — and stole second before advancing to third on catcher Matt Wieters' throwing error. Szczur doubled off reliever Trevor Gott (0-2) to the left-field fence to score Margot. Kirby Yates pitched a perfect eighth, and Brad Hand got three outs after Ryan Zimmerman's single for his 10th save. The Nationals, who had their three-game winning streak snapped, had the go-ahead run on in the seventh on Wieters' leadoff double. But Craig Stammen (1-0) struck out Moises Sierra and Wilmer Difo before pinch-hitter Matt Adams lined out to third. Neither starter figured into the decision, although both pitched well. Gio Gonzalez worked six innings for the Nationals, allowing one run, five hits and three walks. He struck out eight. 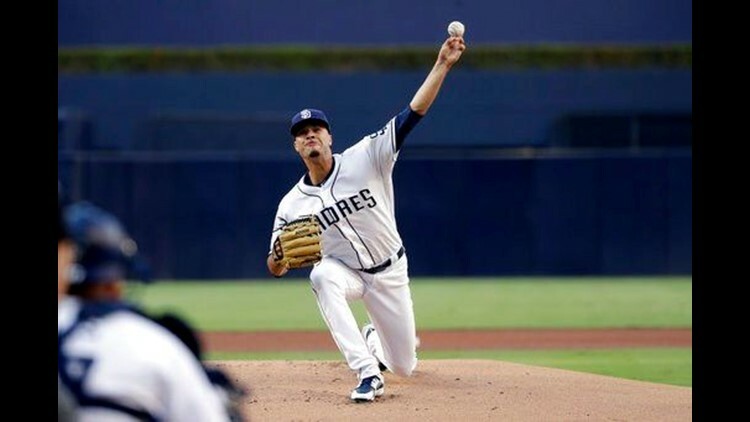 Joey Lucchesi, who entered with the top ERA (3.13) for rookie starters, pitched five-plus innings. He gave up a run and six hits with a walk and six strikeouts. Lucchesi exited when Michael Taylor singled and Trea Turner walked to start the sixth. Stammen entered and got Anthony Rendon to ground into a double play. After a walk, Howie Kendrick flied to right. The Padres broke through in the fourth when A.J. Ellis and Margot hit consecutive doubles to tie it at 1. Rendon hit his eighth homer in the fourth to give the Nationals a 1-0 lead. Nationals: RF Bryce Harper got the day off to rest. ... LHP Matt Grace (groin) suffered a setback in his minor-league rehab assignment after throwing for Triple-A Syracuse on Tuesday. Grace won't make his scheduled appearance on Thursday. Padres: OF Hunter Renfroe (elbow) is hitting in extended spring training games, but hasn't played defense. ... C Austin Hedges (elbow) started a light throwing program. ... OF Wil Myers (oblique) hasn't resume baseball activities. Nationals: RHP Tanner Roark (2-3) starts the first contest of a four-game series at Arizona. Roark, who has lost two of his last three starts, has split his four career decisions against the Diamondbacks. Padres: RHP Jordan Lyles (0-0) makes his season debut as a starter. Lyles has limited opponents to a .194 (14 for 72) batting average in his 19.2 innings of relief.